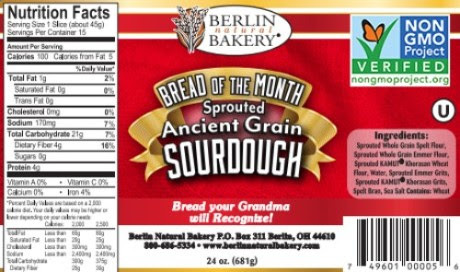 August Bread of the Month: Sprouted Ancient Grain Sourdough! Ok sourdough lovers! You are going to love this! For the month of August we are bringing back one of your Bread of the Month favorites - The Sprouted Ancient Grain Sourdough. If you weren't able to snag a loaf of this sourdough the first time around - here is your chance! This sourdough is just bursting with ancient grain goodness along with its unbeatable nutritional profile. Just take a look at how these ancient grains compare to what we refer to as "modern wheat." Sure, it is nutritionally superior but beyond that, it just plain tastes delectable! Its grittiness allows it to toast to perfection and its density is super satisfying. The Ancient Grain Sourdough also has zero sugar, zero yeast and zero oil - making it perfect for the many of you who stay away from those ingredients.